The world is staring at a global rise in food prices and the culprits are many, ranging from conflict to climate change. According to a report by the United Nations’ World Food Programme, food insecurity linked to higher food prices is a “threat and impact multiplier” for violent conflict. Fragile states with a higher share of food imports are particularly vulnerable to high food prices and this vulnerability has increased over time with increase in global conflicts. The report, titled “Food Insecurity and Violent Conflict”, attributes high food prices in both local and international markets to political instability. According to the UN, conflict often hinders trade and affects the ability of a country to produce. The report cites a study by Ellen Messer, Marc J Cohen and Thomas Marchione, which says that conflict, besides leading to deaths, diseases and displacement, also destroys physical and social capital, damages the environment, affects education and discourages investment. It hampers normal economic activity such as food production and cuts off access to food supplies. African countries are perhaps at the greatest risk of food insecurity due to conflict. 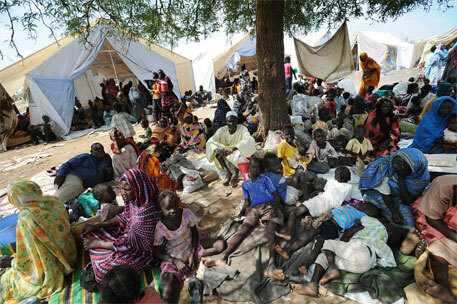 According to the UN report, the civil war in Southern Sudan left an estimated 2.6 million people in need of emergency food aid by 2000, while an estimated two million people have been displaced since the conflict in Darfur broke out in 2003. Quoting IRIN News, the report says that the targeting of food-carrying vessels by Somali pirates recently raised the prices of staples like wheat and rice by up to 22 per cent. The UN’s Food and Agriculture Organization (FAO) says 870,000 people in Somalia are estimated to be in need of emergency assistance, mainly internally displaced persons and poor households. The organisation claims that continued and escalating conflicts in parts of Eastern Africa are threatening local people’s access to food, while drier-than-normal weather conditions could threaten crops and livestock. FAO further says that adverse weather conditions and an escalation of conflicts in Syria and Iraq have had a negative impact on crop production and food security in those countries, pushing up food prices. In Syria, there are fears of severe reduction in the production of cereals, while in Iraq there are reports of deteriorating access to drinking water. The FAO Crop Prospects and Food Situation report estimates that globally, 33 countries, including 26 in Africa, are in need of external assistance due to a combination of conflict, crop failures and high domestic food prices. Crop production in the Central African Republic in 2013 declined by 34 per cent from the previous year. The Worldwatch Institute believes food commodity prices will be higher in the decades to come.